Published in Venice by Ricciardo Amadino in 1605, Molinaro’s Concerti ecclesiastici à due et à quatro voci consists of four-part motets with basso continuo, and two-part motets, Magnificats, and a setting of the Mass with a “Partitura per l’Organo” that is an unharmonized organ transcription of both voices. 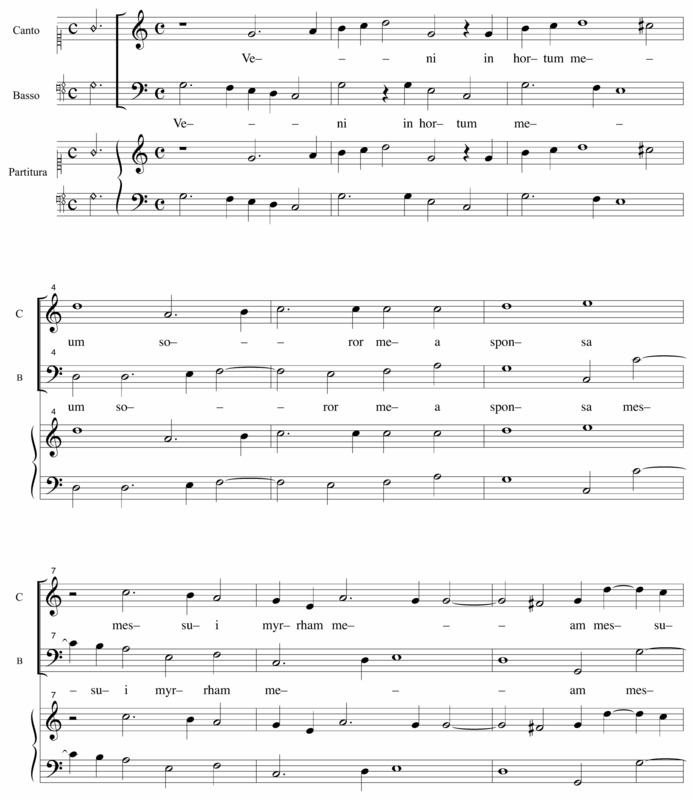 The Song of Songs text of Veni in hortum meum was also set by the Flemish master Orlande de Lassus (c. 1532-94). In Molinaro’s version the words “eat, friends, and drink, and let us be inebriated, my beloved friends” (comedite amici, et bibite, et inebriamini carissimi) are set to music in triple meter to evoke the joy of convivial celebration. The modern-day world premiere of this work and edition was performed in San Francisco in November 2010 by the Chalice Consort.